From a sold out publication. 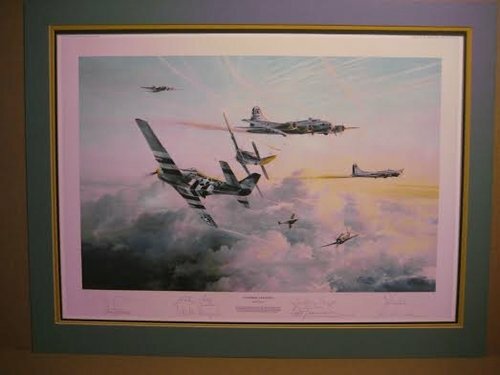 Overall Print Size: 33" x 23.5"
Image size: 28.5" x 20"
Robert Taylor's commemorative print to celebrate the 40th anniversary of the American Air Forces Association is signed by SEVEN of the greatest fighter pilots of WWII (see below). 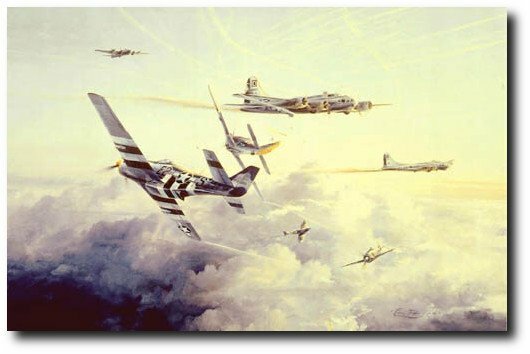 B-17 bombers of the Mighty Eighth are seen returning from a mission over Germany, escorted by P51 Mustangs of the USAAF and RAF Spitfires. Having endured all the flak thrown at them by the ground defenses, the courageous and determined crews now have to face attacks by FW-190 pilots of the Luftwaffe. (15 victories) RAF Hurricane Pilot: Member of "The Guinea Pig Club"